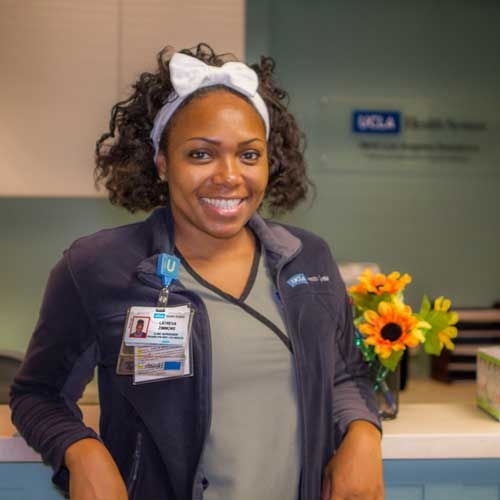 "Care everywhere is our goal at UCLA," says Latreva Zimmons, a clinic supervisor at UCLA Health Pediatrics in West Los Angeles. "Our clinic is just pediatrics. We have five doctors on board, and we see patients from birth all the way to 20 years of age. We service a lot of our UCLA staff, but the clinic also is utilized by a lot of the community. My mother was a paramedic, so I've always been around the medical field. And I've wanted to be a nurse since I was a little kid. I'm in school to get my registered nurse license. I just love being part of the UCLA family."